It took me three trips to Italy to finally lay my eyes on the infamous Leaning Tower of Pisa! Unfortunately the weather was atrocious during my whole visit, but I was still so happy to finally see it. The Leaning Tower is even more amazing in person. It actually looks like it could collapse at any moment. I definitely don't want to be there when it does! People say there's more to Pisa than the Leaning Tower, but unfortunately I just didn't find that to be true. My parents visited Pisa 25 years ago when they were dating and my Dad even said they were ready to move on to another city after about a day. You really only need 1-2 days in Pisa at most. Bar & Food 62: Okay, if there's one meal during my latest trip (2017) that I'll remember for a long time, it's at this restaurant. Alexis and I were walking up to the Leaning Tower and like all Italian restaurant hosts do, we were invited to dine. Usually I just keep my head down and keep walking, but the host caught my attention when he said, "10 euro deal: appetizer, entree, and drink for 10 euro." If you've been living in Europe for four months, you immediately know that is an amazing deal...absolutely unheard of. You typically can't get an appetizer for 10 euro let alone an entire meal! So we immediately sat down and WOW. This was by far the best meal we had during our entire trip. It's one block from The Leaning Tower and you can even see the top of it behind the buildings. We sat outside on the street by some heaters and had the most enjoyable time. Usually I wouldn't rant about a restaurant this much, but you absolutely can't miss this place while you're in Pisa! Salza: This bakery is a must while you're in Pisa. It has endless selections of fresh pastries and an espresso bar. Customers eat and drink whatever they desire and pay at the till on the way out. 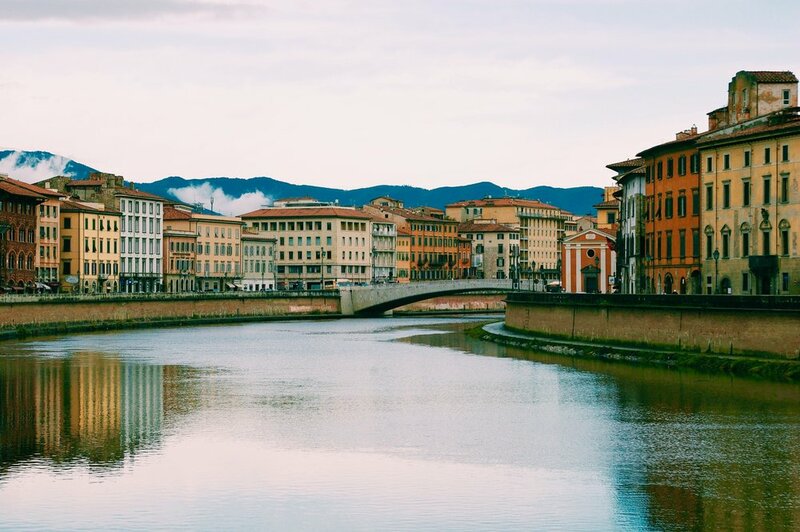 I had one of my top five best AirBnB experiences in Pisa. It was a shame the apartment wasn't in Rome where we spent most of our time in Italy. Located just a few streets over from the main shopping district and a 15 minute walk to the Leaning Tower, this AirBnB is an absolute jackpot! A lovely family owns both this massive apartment and the apartment upstairs. The place they rent out has three huge rooms, a spacious bathroom, and a fully stocked kitchen with every cooking utensil you could possible need. The room itself is as large as my entire apartment in Ireland. The host used to live there so he has bookshelves lining the walls of the room, which is why I initially chose this place (book nerd!) There's a TV, desk to work, comfy couch, and two very comfortable beds! At first I thought it was too good to be true, but it wasn't! We were spoiled. The weather was iffy the first day, so I caught up on some much needed work in Pisa before Alexis arrived from Florence. This was the first AirBnB I could be truly comfortable in and felt like home. We were so sad to leave. I couldn't recommend this apartment more if you're in Pisa! Be sure to tell Valerio I said hello!